PROUD HINDU DHARMA: What is the meaning of Man ? Who is the Only Man? What is the meaning of Man ? Who is referred as the Man as per veda? In Sanathana Dharma (Hindu), Veda says Parabrahma(god) is the Purusha(Man) by saying "sahasra seersha purusha:"
By just uttering word "Purusha" (man), Veda did not reveal who is that Parabrahma? Is that Parabrahma is Brahma? Vishnu? Vinayaka? Rudra? By Saying "sahasra seersha purusha:", it says, "That Purusha (man) who is the creator of this entire universe and also seen in different forms as everything we see, is the Parabrahma (GOD)"
Veda just not Utter this Word "Purusha" in "sahasra seersha purusha:" alone. If you see Veda Mantra, it uses this Word "Purusha" in several places without revealing who is that Purusha as Parabrahma. In Other place, Veda says "Purushayam purush meekshathey" which means "That Purusha reside inside every being. With Deep Meditation try to Look at him who is staying inside you. That purusha is the paramathma"
In Other place, Veda says "Poorvamevaa ihaa samithi thath purushashya purushathvam" which means "That Purusha alone was there even before all creations. That purusha is the only one who was not created by other. That purusha is the paramathma"
By Just uttering the word "Purusha" as Parabrahma and not referring who is he, the devotee of Rudra used this word "Purusha", "Eswara", "Parabrahma" for Lord Shiva because of their love and affection. Similarly, Devotee of Other gods like Indra, Vinayaka, Agni, Surya used this word "Purusha", "Eswara", "Parabrahma" for their God because of their love and affection. As Veda says "Purushayam purush meekshathey" which means "That Purusha (man) reside inside every being. With Deep Meditation try to Look at him who is staying inside you. That purusha is the paramathma", worshiping anyone of these devata as Purusha is not deniable as that purusha resides inside every being. Devotees of each Devata says "Since Veda does not refer who is that Purusha, why cant we use that Title of Purusha to our God? Why cant we say our God is Supreme (Paramathma)?
" ह्रीश्च॑ ते ल॒क्ष्मीश्च॒ पत्न्यौ॓"
i.e., "hreeshchcham they lakshmeemcha pathnyow"
By Uttering this word, Veda says "That Purusha's wife name is Lakshmi"
Once Veda says That Paramathma's Wife is Lakshmi, all other demi-gods take a step back as they are not Lakshmi's husband that Veda refers. By this Vedic Word " ह्रीश्च॑ ते ल॒क्ष्मीश्च॒ पत्न्यौ॓", Veda says "That Purusha, That Parabrahma is the Lord Vishnu whose wife is Lakshmi"
Veda also says "sa eka purusha:" that means, "There is only one Man (Purusha)". By saying this, Veda says, rest of all creations including his 1st creation Brahma till small living beings in earth are considered as "Female" in front of this Purusha. 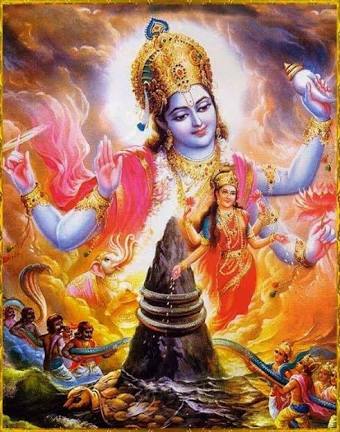 Lord Vishnu is the Only Man. He is the Only Purusha. He is the Parabrahma. The Marriage incident of Mahalakshmi proved this statement when we see the story of her Marriage. When Lord Vishnu told Deva to Grind the Milky Ocean (Ksheerapthi) and take up the Amrita to stay healthy and live long, Deva along with Asura started Grinding the Ocean with a Mountain. At first, came the poison which Lord Shiva came and drink and became "NeelaKanda". 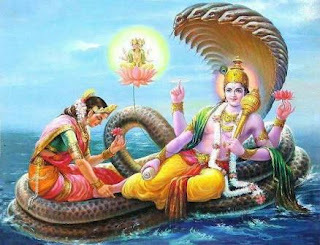 He also showed that He is also eternal and one and and same of Lord Vishnu even if he drink a Poison. 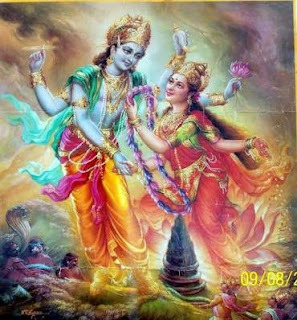 Whatever appeared on the ocean which are divine, are shared between Asura and Devas. Then appeared a Divine Woman "Sri MahaLakshmi" having a Lotus Flower at her hand from the Ocean. Devas and Asuras seeing her appear from the Ocean, thought she will marry anyone them and stood in Queue. Mahalakshmi noticed Lord Vishnu standing aside and far away from this crowd with no interest to compete with Deva and Asura. After Seeing Lord Vishnu, Mahalakshmi felt immediately that all Deva and Asura look like a woman in front of his Qualities of Purusha (Man). Without any Hesitation and Fear, amidst of Deva and Asura, she walked towards Lord Vishnu and placed the Lotus Garland around his Neck and married Lord Vishnu. This is exact context, what Veda Says as "sa eka purusha:" (There is only 1 Man). He is Lord Vishnu. Any Men who comes in front of Lord Vishnu will be like a Woman because of his purusha (men) qualities. Let us analyze, Why woman is referred little Low compared to Men? We should not look and understand the difference of Woman and Men in normal way. It has deeper meaning. Veda is not saying the man in human, animal. It talks vishnu is the only man. It means it says rest are all women. So it is not about a comparison that we talk about man and woman in human. In this earth, a girl from birth is protected and taken care by someone else. From birth, she is protected by their parents or someone very close to them. After marriage, she is protected and taken care by her husband. Then, she is protected by her children. Since they ensure protection, she abides by their guidance ag every instance. Before marriage she accepts advices from her parents. Then she accepts her husband, then her children. In a complete uncivilized country where law is misused and danger prevails, a men can survive those tough challenges, but woman will not live safe. A woman need protection from her own family and also to mingle with society, she require tough laws and culture to respect individual. She depends on protection to survive. Hence women is considered as dependent but men are considered as guards to them safety and protection. With the same context, Veda says, "there is only purusha (men) called Vishnu, who existed even before all creations, and he is not created by anyone else". Why veda, says only Vishnu is the Purusha? What qualities define a Men according to Veda? Why even indira, agni, all humans, animals, insects, birds or any other is considered as women in front of him? Veda says, "the reason why vishnu is the only purusha (man) is because of his "nithya swaathanthriyam"
"nithya swaathanthriyam" means, "who never have to obey to anyone or anytime". Veda says, the Purusha who never have to obey anyone or anytime and free to take his own decision is the para brahma called Vishnu, whose wife is lakshmi. Even brahma, indira had to go for his mercy at tough times. 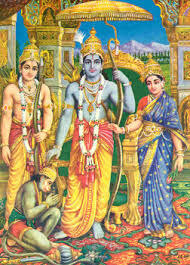 He is termed as only purusha (men) because everyone else will look for support on someone or some stage of their life. 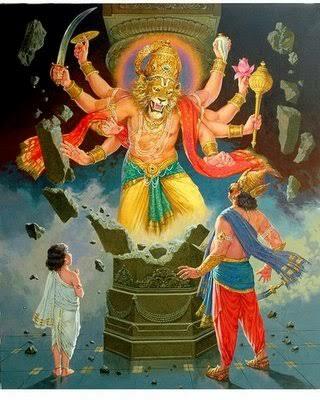 Why we all are not considered as man in front of vishnu? Dependent to our own body which is the reason why we can't even ignore hunger and have to work for food. Dependent to husband if she is Wife. Dependent to wife if he is husband. Thus, everyone at one stage of life, we depend on some people or sometime. Veda asks how can a person who is dependent to time, nature, people can be said as purusha? Not dependent for his action to get result, as he decides his result on his own command. Not dependent to any god as none exist above him. Thus, because he is independent and don't depend on anyone or anytime, veda says that husband of lakshmi is the only Purusha who need to be worshipped by everyone to lead happy life during life time and after life to reach moksha. Veda says, knowing the truth of who is purusha, start doing bhakti (devotion) to this great purusha with love and affection who created you as well. By doing true bhakti, if a person gets the grace and blessing of Vishnu (parabrahma), then even if the world falls down against that person, no one can do anything. Vishnu came to this earth in vibhava avatar like narasimha, rama, krishna etc for certain purpose. Worshipping these forms are also worshipping that purusha in his vibhava form. 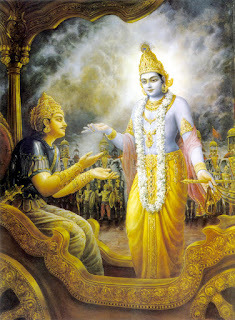 In his vibhava avatar as Shri Krishna, he speaks to arjuna the war warrior at the battle field in a lengthy conversation. This speech between krishna and arjuna are considered the essence of veda and what that purusha (man) who is the parabrahma expects from all of us. When vyasa starts writing story of that shri krishna, he starts from that parabrahma who himself came to ksheeraapthi as vishnu and came as vibhava avatar in this world. 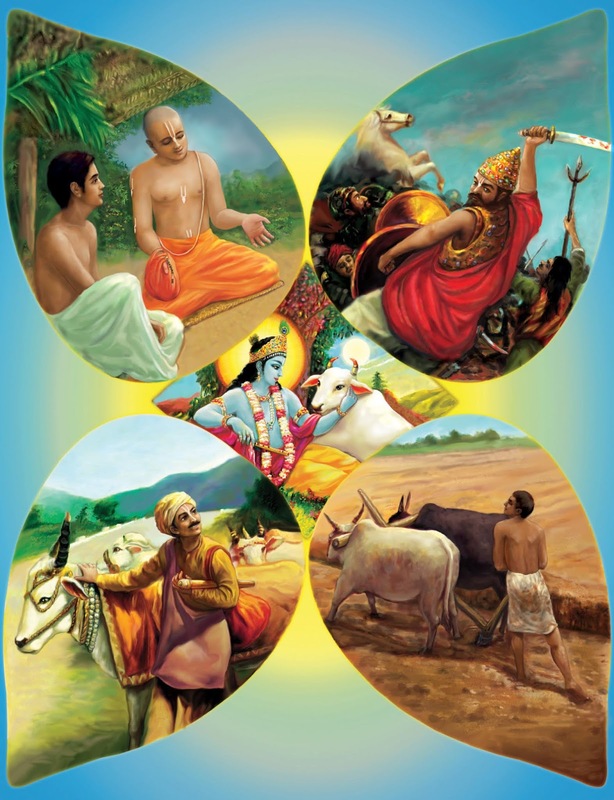 After writing the complete story of shri krishna he named the book as Bhagavatham which again says it is not an ordinary human story, but the story of that bhagavan (god) who is the only purusha to be worshipped by everyone. Understanding veda directly is extremely tough as without guidance it is hard to know the essence of truth. That parabrahma came himself as Shri Krishna and gave us the bhagavad gita which can be read and understood and can be followed. If a person born as human irrespective of color, Nation, must read bhagavad gita once and atleast try to follow 1 advice which krishna says thru out his/her lifetime with no excuses. This assures happy life in this life and assures moksha after life as well. While speaking to arjuna, Shri Krishna himself talks about this word "purusha" in few places. Paramaath yeth yudhaa hrutha: ! "Dear Arjuna, veda says that purusha is not dependent on this nature or living things you see. That purusha who is eternal and not created by someone, have the capacity to control and guide both these nature and living beings on his command. That purusha is none other than me who came as vibhava avatar in this earth. Understand that i am that purushothaman (man) who is independent and controlling the Nature and living on my command. Let all of us worship that purusha who is referred as husband of lakshmi, vishnu with folded hands with love and affection to protect us and give us happy life. Let us celebrate the divine voice of shri krishna and read bhagavad gita and devoted to that purusha named shri krishna, shri rama, shri narasimha.